Aberdeen students are in the midst of intense rehearsals ahead of the famous Student Show which runs this week. A long-standing tradition in the city, many people flock to HMT every year to see the production. 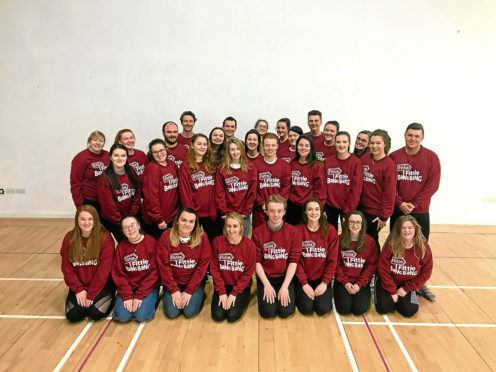 Part of the annual Aberdeen University Student Association Charities Campaign, the past shows have raised thousands for local charities, including £100,000 from Michty Mia! the 2016 show. The show usually parodies a well-known title, and this year is no different. After the success last year of Sister Echt, the team are back with another show with an Aberdonian twist – Fittie Fittie Bang Bang. Involving students from The Robert Gordon University, the University of Aberdeen and North East Scotland College (NESCol), the young team have worked hard through an intense period of rehearsals. Eighteen-year-old Bradley Phillips is making his debut at HMT with the Student Show in the role of male lead Dycie, but the NESCol sports development and coaching student is no stranger to the stage. Bradley developed his passion for theatre in school and has continued to juggle acting with his course work, including a performance of Spring Awakening planned for June. With the old population of Aberdeen disappearing, the hero is on a mission to track down his elderly relatives and save them from a sinister fate. The Doric tale takes the audience from a retirement village to a lighthouse in Fittie and promises plenty of laughter along the way. But does the lasting popularity of the Student Show, which has been running since 1921, create a lot of pressure for the cast to live up to? Bradley, who is from Aberdeen, said: “People do buy tickets just because it is the Student Show and the reputation. “Personally, I have been in various shows and put pressure on myself to be the best I can be and to feel that I have done my best. “I think if you are harder on yourself then it makes it all worth it at the end. “It is quite intense – we started with the auditions in mid-March and had roughly four weeks of rehearsals and the past two weeks have been from like 10am to 10pm. The Student Show is a real collaborative effort, with all of the cast pitching in to find their own costumes for the colourful characters and to create the scenery. The production allows the students to step on to the stage at HMT, which has seen performances from big names, including Sir Sean Connery and Sir Ian McKellan among the many. Even though Bradley recently performed at the Tivoli just down the road, the breathtaking auditorium of HMT might be a bit daunting. “I’m nervous. It is a big part and I have had one rehearsal downstairs in the theatre but have never been on the main stage,” he said. “It is quite scary performing to more than 1,000 people rather than 20 or 200, but I think it is also really exciting.